PlexiDor cat house doors are professionally engineered and manufactured in the U.S.A. from quality materials for the optimal comfort and safety of your cat - and of course, to be long-lasting! 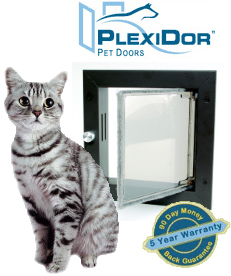 All PlexiDor pet doors are backed by a 90-day satisfaction guarantee and 10-year warranty! A sturdy aluminum frame and heavy-duty springs are standard features for unsurpassed durability, safety, and security. The 2-way self-closing hinge mechanism is concealed in the frame and closes quietly and gently so it won't disturb you or scare your cat. Only a gentle push is necessary to open the door so it is easy and safe for your cat or kitten to use. The panels are edged with snug-fitting, high density nylon pile for a tight weather seal and superior draft-proofing. The acrylic panels are molded to form a thermo-pane effect, whereby a pocket of air is trapped between the inner and outer layers. Much in the same way a modern double-pane window is more energy efficient than an old single-pane window, the Thermo-Pane provides superior insulation to retain heat in the winter and block heat in the summer. Designed to be mounted in an exterior door. All the premium features you expect in a quality cat door - industry leading draft-proofing and energy efficiency, lock, sturdy aluminum frame, concealed hinges, thermo-pane acrylic panels, and unsurpassed 10-year warranty. Available in 3 colors! Designed to be mounted on an exterior wall. All the premium features you expect in a quality cat door - industry leading draft-proofing and energy efficiency, lock, sturdy aluminum frame, concealed hinges, sloped wall tunnel, thermo-pane acrylic panels, and unsurpassed 10-year warranty. Available in 3 colors. One of the most sophisticated cat / dog doors on the market today, only opening for your cat while keeping other animals out. The key to the technology is an electronic RFID (radio frequency identification) "key" that is attached to your cat's collar. Available in white or brown. Door-mount and wall-mount models available.